Still in the slow process of making my house an armory, so I picked up this nice sturdy and sharp battle axe. Where do you keep your arms? No kidding, you really don't want to trip over loose carpet in that house! Things that go boom in a locked room inside locked cabinets with trigger locks attached. Sharp and pointy things all over the place. Are any of these "battle-ready" or are they just wallhangers? I don;t mean original antiques, but could you split a thief in two with one of these? I do not really believe in wall hangers all that much. That sword you see is an exception as my father bought that for me in grade 9. 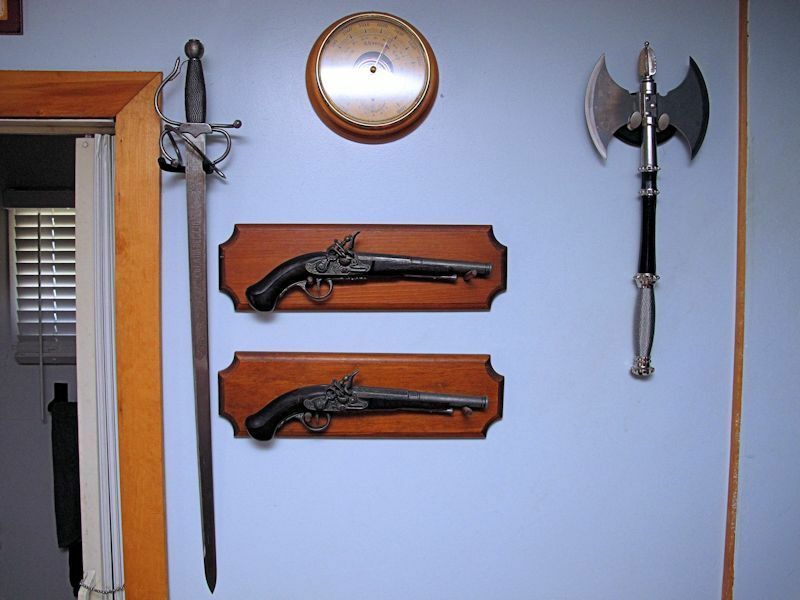 Those old pistols are also just decoration as I do have to follow Canadian firearm guidelines for display purposes (That would require a steel cable secured to the wall, and that would just ruin the aesthetics...so I tend to keep myself to old time arms.. Most every other sword in my house is battle ready, and made with superior steel to its historical compatriots, as is the various spears, machetes, and axes that hang on my walls. Not sure I would attack intruders with them...but they might get intimidated if they tried. Yes, I know, my house is not exactly kid friendly. kids learn after making small errors like stabbing themselves. I hope there are no earthquakes where you live Chako!! I decorate my home not for home defense. 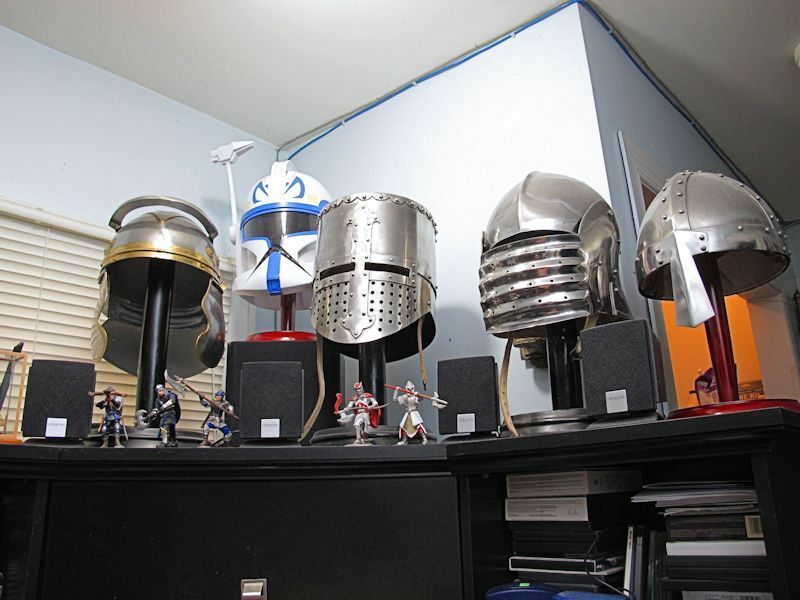 Speaking of armour, I just got in two more helmet stands. I needed them for the Roman helmet and for a Star Wars Captain Rex Clone War helmet that a former student gave to me before he graduated. that's how my gramps taught me how to use an axe!! If there ever is an earthquake the last thing I will be worring about are holes in my floor. As for break in artist...they better hope I am not home. Add some fake blood splatters against the wall and no burglar will want to enter! And drip some on the floor. Under the charcoal outline on the ceiling. People see things like that and they just walk away. They don't think, they don't reason, they just fear. And leave.